Business Before Breakfast is held on the first and third Friday of the month at Chick-fil-A and The Villages, both on Federal Rd. Consult our Facebook page for the location as they vary monthly. Along with great food, friends, and your elevator speech, there is also a question of the week designed to evoke conversation and share best business practices. This event is open to all, free of charge. Please contact Linda McCaffrey with any questions. Enjoy a variety of interesting and educational speakers while networking with other members of our community. The topics are always business related and our events are typically held at a local member restaurant or catered at the Brookfield Chamber Office. Interested in speaking? All you have to do is be a member and contact Matt Gioglio for dates/details. Please see our Calendar for the specifics of each Lunch & Learn event. The Brookfield Chamber hosts Business Gatherings normally on the first Wednesday of each month. The venue and sponsors change for each gathering. Sponsoring an event is a great way to showcase your business and it provides you with the opportunity to speak to a captive audience about the benefits of working with you! Aside from hearing from our sponsors, getting chamber updates and raffle prizes, our Business Gathering format is ‘open networking’. It’s a great chance to unwind from the day, shake hands with new and old friends, grab a cocktail, some appetizers, and build your network! We’ve got special events for the whole community! Enjoy breakfast at the Annual Meeting and dancing at the Gala! 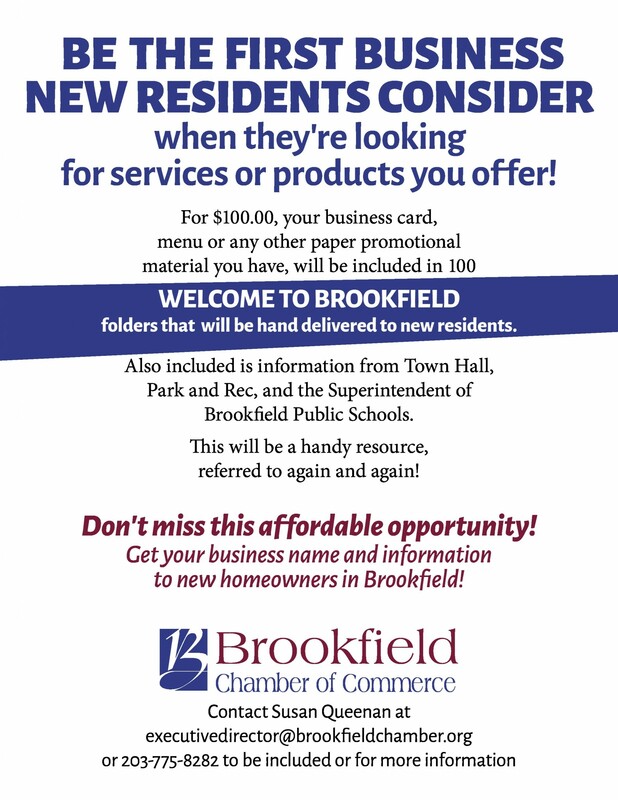 You can also visit local services and businesses at the Health Fair and the Best of Brookfield, and more! Please see our chamber calendar and contact Susan Queenan for questions about these events.